Gone are the days when I could spend 20 minutes getting ready for the day or winding down for the evening. As a mom, I have roughly 2 minutes for my a.m. and p.m. skin care routine before I have to rush out the door to drop off my son to preschool or tuck my kids into bed. Here are my quickie a.m. and p.m. skincare routines and essential products! 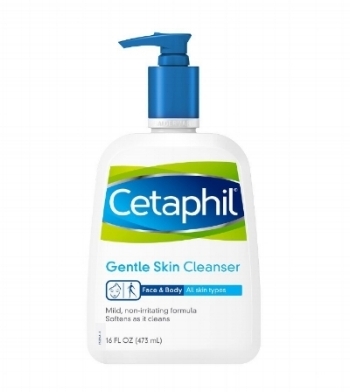 Step 1 – Cleanse: Cetaphil Gentle Skin Cleanser. Because who needs a harsh face cleanser when all you did was sleep (sort, of)? This face wash is so gentle you don’t even need to use water to remove it; you can simply wipe it off with a cotton pad and your skin will feel clean and soft. $18, for a pack of two on Amazon. Step 2 – Moisturize: Clinique Dramatically Different Moisturizing Lotion+. I have been using this product since my early 20s, and it’s very effective. My mom has been using this product ever since I can remember, and she looks like she’s 40 even though she’s 50-something years old (see Mom, I didn’t reveal your age). $27 on Amazon. Step 3 – Protect: AmorePacific Natural Protector Broad Spectrum SPF 35 Sunscreen. It’s hard for me to find a sunscreen that doesn’t leave my brown skin looking ashy. This one is absolutely amazing because it leaves zero white streaks and blends into the skin so naturally. Bonus, it also feels very silky and does not aggravate my sensitive skin. $65 at Sephora. Step 1 – Cleanse: Clinique Take The Day Off Cleansing Oil. This is definitely the best combination of the make up remover and a cleanser hands-down! Foundation, mascara, and eyeliner come off so easily so I don’t have to use that much product each time I wash my face. Great value here! $35 on Amazon. AmorePacific Moisture Bound Rejuvenating Serum. This product is water-based and very lightweight. It’s great if you have oily skin or if you tend to layer skincare products on at night time (moisturizer, eye cream, anti-aging cream, etc.) $150 on Amazon. On the weekends I will take 4 to 5 more minutes on my routine to add a treatment. Step 3 – Treat: Glamglow Youthmud Tinglexfoliate Treatment. I could hardly believe this product the first time I used it. I had a little eczema patch on my face and with one use of this product that eczema went away. I don’t typically use masks but I highly recommend this one. And it gives your skin a tingly feeling as if it’s suctioning out all the dirt from your pores – pretty cool. $41 on Amazon. Step 4 – Treat: Clarins Double Serum Treatment. This antiaging serum is great for all skin types and feels light and weightless. On sale for $60 on Amazon. What products do you love to use for your skincare morning and evening routines? Next I’ve Cloned Myself so I can Practice Yoga with YOU!